Whether you're an HR professional or a manager, chances are there's one task you really dislike: giving performance reviews. Even if you know the basic points you want to get across, finding the right words and committing them to paper is about as much fun as a trip to the dentist. 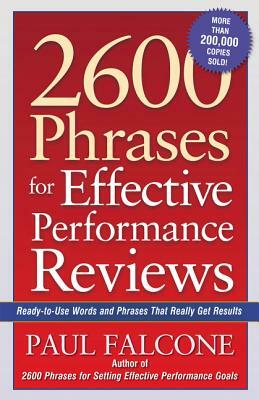 But this handy little book puts thousands of ready-to-use words, phrases, descriptions, and action items right at your fingertips. Paul Falcone covers the 25 most commonly rated performance factors, including productivity, time management, teamwork, and decision making, plus job-specific parameters that apply in sales, customer service, finance, and many other areas. Not just for review time, the book will also be instrumental in creating job descriptions and development plans as well as for monitoring performance, progress, and problems year-round. Praise for Paul Falcone's Previous Books: "If the art and science of hiring and firing has become a puzzle, then author Paul Falcone The Hiring and Firing Question and Answer Book] has the answer." -- Houston Business Journal "When you feel the need to document an employee's actions (or inactions), turn to this great tool 101 Sample Write-Ups for Documenting Employee Performance Problems]." -- Legal Management " 96 Great Interview Questions to Ask Before You Hire] takes the guesswork out of the interview process." -- Benefits and Compensation Solutions Paul Falcone is a human resources executive and has held senior-level positions with Nickelodeon, Paramount Pictures, and Time Warner. He is the author of several bestselling books, including 101 Sample Write-Ups for Documenting Employee Performance Problems, 101 Tough Conversations to Have with Employees, and 2600 Phrases for Setting Effective Performance Goals. He is a long-time contributor to HR Magazine. Visit him at www.PaulFalconeHR.com. Paul Falcone is a leadership & human resources consultant in Southern California and has held senior-level HR executive positions with Nickelodeon, Paramount Pictures, and Time Warner. He is the author of several best-selling books, including 2600 Phrases for Effective Performance Reviews, 2600 Phrases for Setting Effective Performance Goals, 101 Sample Write-Ups for Documenting Employee Performance Problems, 101 Tough Conversations to Have with Employees, and 96 Great Interview Questions to Ask Before You Hire, and. Paul's consulting practice focuses on effective hiring, performance management, leadership development, and strengthening the muscle of a company's frontline leadership team. He is a long-term contributor to HR Magazine. Visit him at www.PaulFalconeHR.com.